When reading a text where initialisms are frequently used, the initialisms tend to stand out from the rest of the text unless they are typeset with small caps. For this reason, I prefer to typeset all initialisms with small caps. However, when various product names, software, type designation, serial numbers, etc. have strange combinations of initialisms, numbers and regular names, it becomes a challenge to define consistent rules while also ensuring that the result is visually pleasing. I've compiled a list of examples below. Should the names always start with an uppercase letter? Should initialisms within a name (ref. 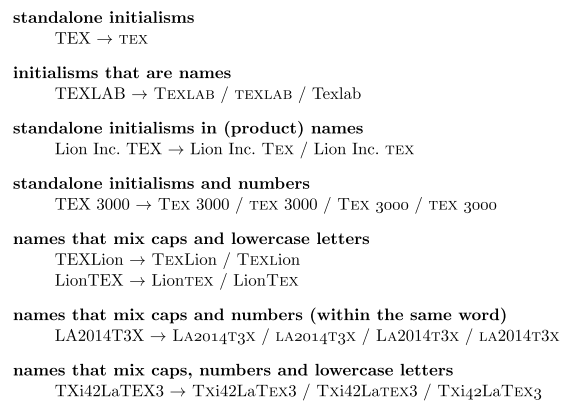 the LionTEX example) also start with an uppercase letter? What about the numbers? The small caps numbers look bad, so I'd prefer to avoid using them. And either way the numbers are the same size as regular caps. Should I resize the numbers? If so, how? Or should I use \oldstylenums? And if I use different sizes/types of numbers, when should I use the smaller numbers, and when should I use the regular numbers? I would love to read your input on this. i think this isn't really on-topic here, but here are some opinions based on what is done in tugboat. look at the web site or documentation for the name source to see how the string is used there, and how caps are applied by the owner in different contexts. if there is never a distinction between caps/lowercase, don't apply an initial cap. "IBM" looks just plain silly if the "I" is cap height and the "BM" are small caps. use lining figures. oldstyle figures look good only with true lowercase. if the lining figures look too large, then "smallify" them, setting them one size smaller. this usually has to be a manual operation (look for a package that provides a \smaller operation), but the improvement in appearance is worth the effort. if, like the tugboat editorial crew, you find that the "provided" small caps "disappear" in ordinary text (say, because their height is equal to the x-height), consider setting your acronyms slightly larger -- if 11pt small caps are available, that might be an option for 10pt text; or do as tugboat has done, and use "full caps" a size smaller (9pt caps in 10pt text, etc.). (look into the file ltugboat.cls to see how \acro is defined; ltugboat.cls is on ctan and also in tex live.) aside: the only almost-x-height small caps i can remember seeing that look distinct are the ones used by the economist; you can even distinguish between lowercase "s" and small cap "s" standing alone, and the small cap "o" is a delight! when you've achieved something that you are satisfied "looks good" (that will always be subjective), build a little package and use it consistently. Not the answer you're looking for? Browse other questions tagged typography small-caps or ask your own question. EB Garamond (bold) small caps “suddenly” unavailable in lualatex?